Walk down any aisle of a grocery store and you’ll find a variety of packaging types used for food. While these packages generally provide important nutritional information to consumers, their larger purpose is to protect and preserve the quality of the food stored inside. Limiting exposure to risks such as temperature, sunlight, and bacteria along with preventing loss and spillage can help extend the shelf life of food, while ensuring its overall safety and integrity. Different types of food are packaged in different ways for preservation and protection. Left: Carton of eggs. Image by Alisha Vargas. Licensed under CC BY 2.0, via Flickr Creative Commons. Right: Plastic carton filled with strawberries. Image by tuchodi. Licensed under CC BY 2.0, via Flickr Creative Commons. In an effort to promote greater sustainability, many of today’s food packages are created with recycled materials. This approach helps the food industry contribute to the global quest of lowering energy use, reducing waste, and preventing pollution. But some of the recycled plastic, paper, and cardboard used for this purpose can contain mineral oil hydrocarbons (MOHs), both saturated (MOSHs) and aromatic (MOAHs), as they are used in the industrial inks that print information onto such products. This is a cause for concern, as these substances, which the European Food Safety Authority recognized as posing potential human health risks, can migrate from the recycled materials of the packaging to the product. 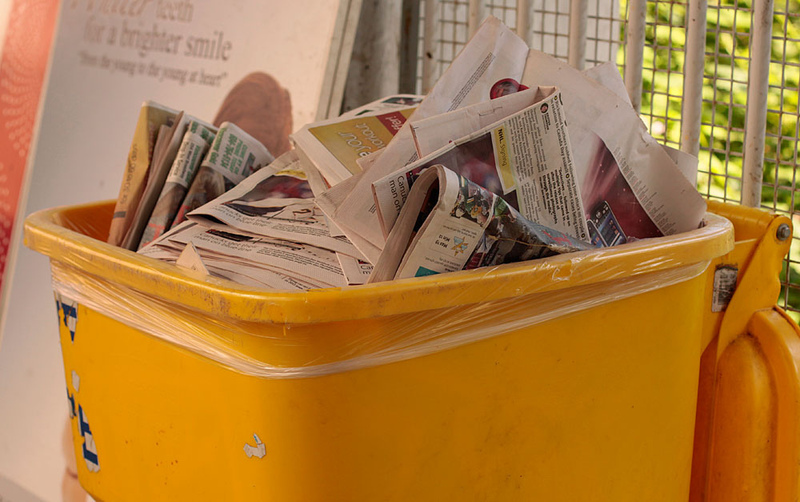 Some recycled materials used for food packaging, such as newspapers, can contain traces of mineral oil hydrocarbons. Image by waferboard. Licensed under CC BY 2.0, via Flickr Creative Commons. 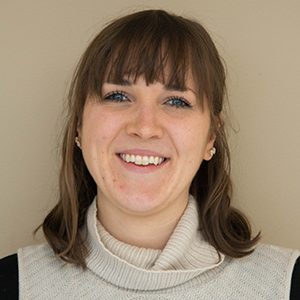 With an experimental approach, understanding the migration kinetics of mineral oil hydrocarbons in food packaging can be rather time consuming and expensive. Looking for a more efficient alternative, researchers at the Technical University of Munich developed a numerical model to describe this process for a wide range of packaging situations. Their simulation work provides valuable insight into ways we can limit food’s exposure to such substances. For their analyses, the researchers simulated the migration of MOSH/MOAH components through a plastic packaging material. Because food packaging is typically quite thin in comparison to the food it stores, this was treated as a 1D problem, with the food assumed to be symmetric around the center. The migration of the mineral oil hydrocarbon substances through the packaging materials was described by Fick’s law of diffusion via the Transport of Diluted Species interface. Note that the researchers did not account for the loss of the substances to the environment in this study. 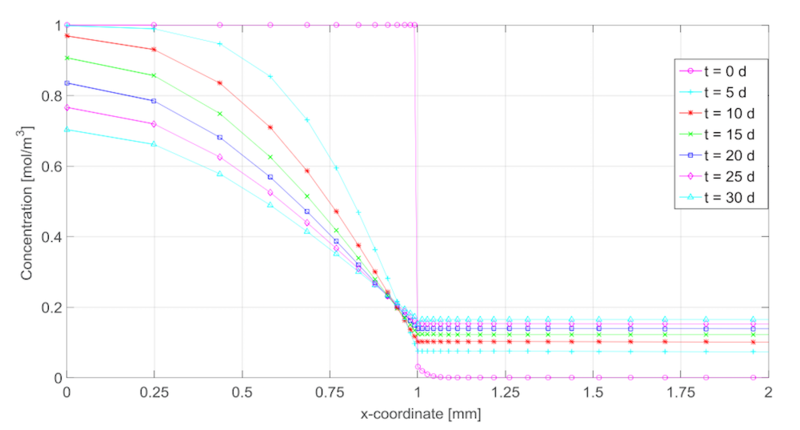 The plot below represents the time-dependent concentration profiles for a single-layer packaging that is 1 mm thick following isothermal storage. In this case, there is diffusion resistance within the packaging and a large portion of the substance (a mixture of MOSH/MOAH components) migrates from the packaging to the food. Plot depicting the concentration profiles for a single-layer packaging. Image by C. Kirse, F. Edel, and H. Briesen and taken from their COMSOL Conference 2016 Munich poster. The following plot shows the amount of substance that has migrated into the food as a function of its molar mass. The results indicate that substances with a greater molecular weight have slower migration patterns. This can be attributed to the fact that these substances have lower diffusion coefficients. 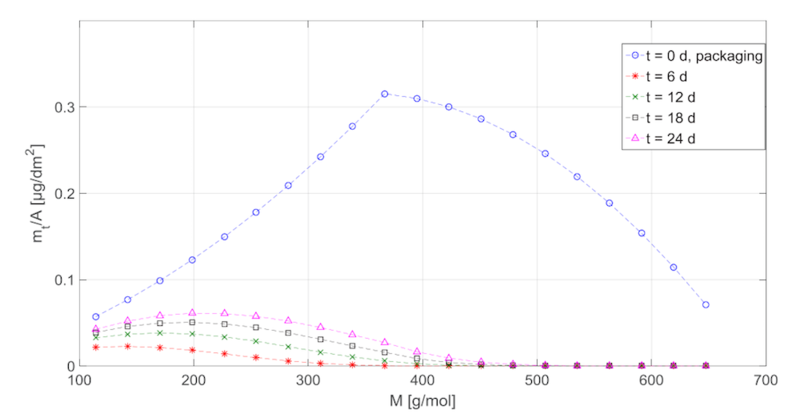 Plot depicting the amount of substance as a function of its molar mass. Image by C. Kirse, F. Edel, and H. Briesen and taken from their COMSOL Conference 2016 Munich poster. While the example highlighted above accounts for isothermal storage, the model can also be used to describe temperature changes that occur during storage via stepwise and analytical functions. Including adsorption layers and evaporation of the substances to their surrounding environment is also an option. Looking ahead, the researchers are planning to model diffusion in porous networks, such as that in paper packaging, as Fick’s law of diffusion can only adequately describe diffusion in these systems in some cases. They also plan to use experimental results from measuring migration to estimate parameters for their simulation studies. This will allow them to model more realistic food packaging designs and thus pave the way for further advancements in food safety. Why Doesn't the Ice Cream in a Baked Alaska Melt?